Coconut milk is an ingredient I just started using a few years ago, when we began trying out a few recipes for curry dishes at home. Until I made my own curry, I never would have guessed that coconut milk was used so heavily in Indian food. I love the creamy, rich quality it adds, and that it's also versatile enough to use in both savory and sweet dishes. We don't eat out all that often, but when we do, if it's not for sushi or oysters, then we love going out for spicy curry. During the first year that we were dating, one of our favorite restaurants was an Indian restaurant in Longmont, and we'd linger there over hot vindaloo curries with lamb and potatoes or lobster masala in a creamy tomato curry sauce. Always with steaming bowls of jasmine rice to cool our mouths. We're actually making curry for dinner at home tonight - I can't wait! 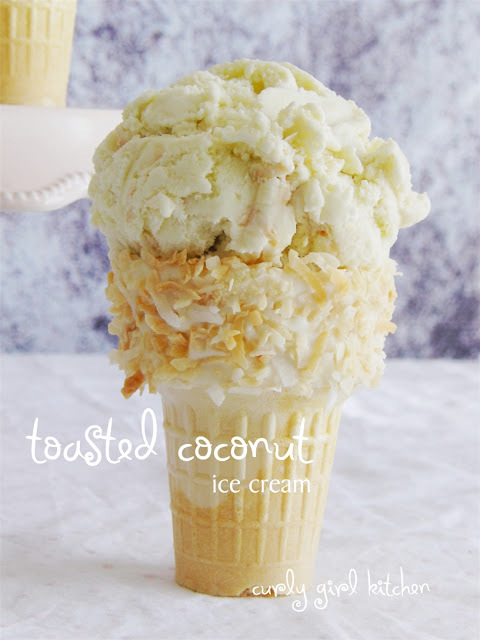 Ever since I made a Coconut Cream Pie for Easter, I've been wanting to try making a coconut ice cream from coconut milk. 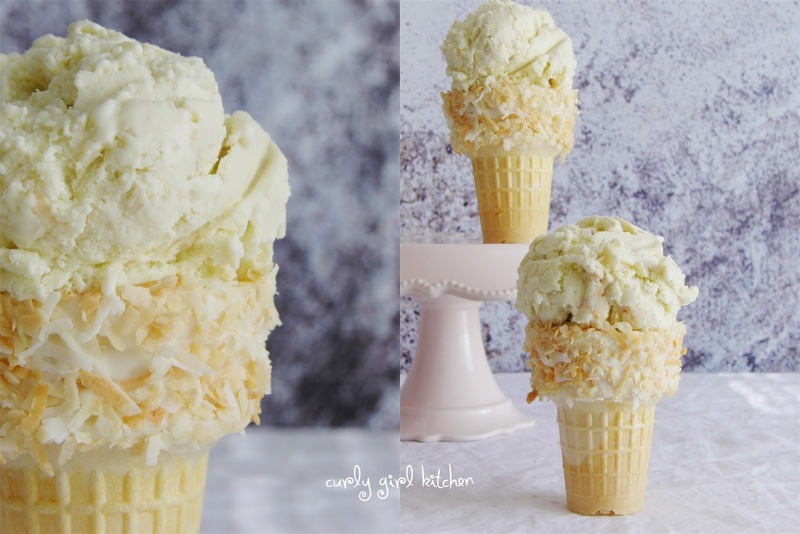 This is a simple 5-ingredient ice cream - just cream, coconut milk, egg yolks, sugar and toasted coconut - that has a wonderfully fragrant flavor of coconut from both the milk and the toasted flakes. 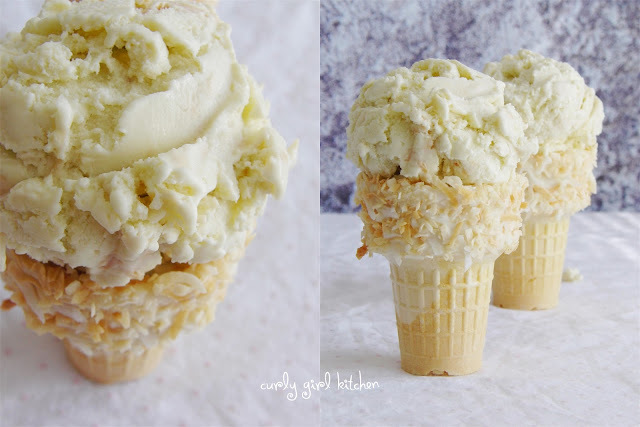 I used the coconut milk much more heavily than the cream, but you could definitely play with the amounts as you like - more cream will yield a richer ice cream. For fun, I dipped ice cream cones in melted white chocolate, then rolled them in toasted coconut, letting the chocolate firm back up. They make a pretty presentation for serving scoops of the ice cream. To toast the coconut, spread it evenly on a baking sheet and toast in a 300-degree oven for 5-10 minutes until lightly browned – watch it carefully as it can go from golden brown to burned very quickly. 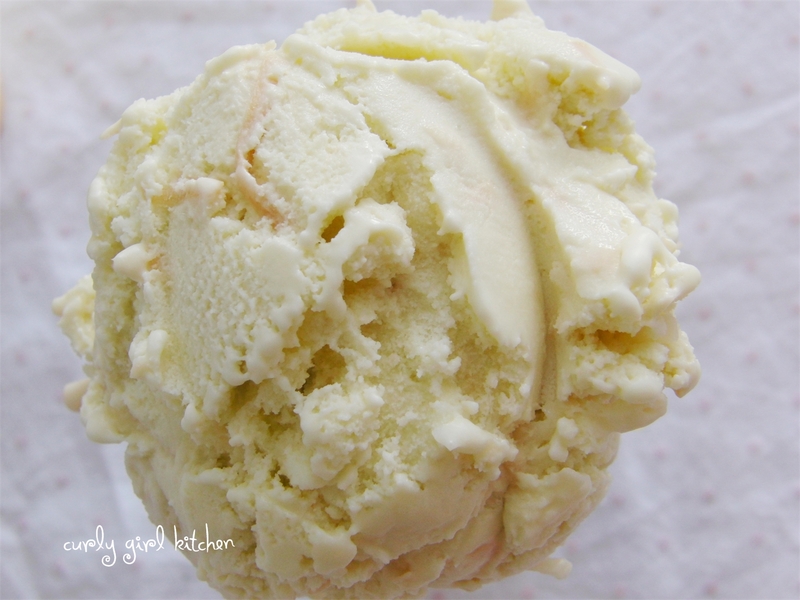 You can adjust the quantities of cream and coconut milk and use more cream and less milk for a richer ice cream. If you do this, you might want to add a little coconut extract so that it still tastes very coconuty. In a saucepan, combine the cream and coconut milk. Set over medium heat and bring to a gentle simmer, just until it begins to bubble around the edges. In a separate bowl, whisk together the egg yolks and sugar. When the milk is simmering, slowly stream a cup of the hot milk into the egg mixture, whisking constantly to temper the eggs. Scrape the egg mixture back into the saucepan. Whisk the custard constantly while continuing to cook over medium heat, just until thick enough to coat a spoon, about 5 minutes. Transfer to a container, cover and refrigerate until thoroughly chilled, or overnight. Take the chilled coconut custard and churn it in your ice cream maker according to the manufacturer’s instructions. Stir in the toasted coconut. Freeze until firm, about 4-6 hours.